Lapeyre Stair's steel bolted stair Models 03/04 provide a cost-effective stair system for commercial applications. These models can be quickly and easily assembled at commercial job sites without certified welders or expensive installation equipment. 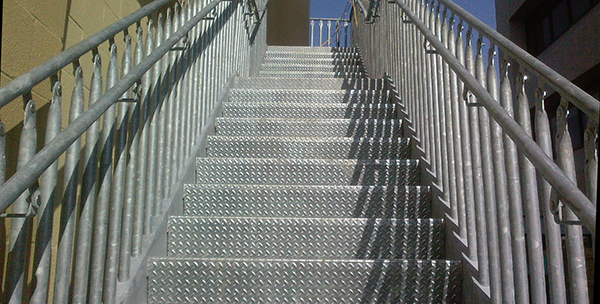 Steel bolted egress stairs for industrial applications are also available. Guardrails and handrails are designed within the parameters of the building codes and field conditions of each project. They can be used separately or together. Models 03 and 04 comply with IBC Industrial code, which requires an inside handrail in addition to a guardrail. Default is guardrails on both sides. Guardrail may be eliminated for stairs against a wall. Stairs without guardrails have a narrower stringer. Guardrails extend 42" above nosing of tread and end at the top/bottom of the stair. Commercial stairs have balusters spaced so that a 4'' sphere cannot pass between. Industrial stairs have balusters spaced so that a 21'' sphere cannot pass between. Optional filler panels replace full balusters. Filler panels can be the same color as the stair or a complementary color. Concrete pan tread has a wrap-around front diamond tread plate nosing and arrives ready for site-poured concrete. Available in depths of 9¾'', 1015/16'' and 12&frac18;''. Smooth tread has a solid surface designed for the installation of carpeting, non-slip flooring, or other flooring material directly to the stair and should not be used alone. PROJECTED TREAD DEPTH (TREAD RUN) 10" 11.5"
TREAD WIDTH (INSIDE STAIR WIDTH) 36" 60"
*Minimum/maximum height and angle restriction ranges vary based on the stair width and the type of tread. Contact Us for more information.